As there is no Processor Expert in the NXP Kinetis SDK V2.0 (see “First NXP Kinetis SDK Release: SDK V2.0 with Online On-Demand Package Builder“), how to do the same in a SDK V2.0 project? So if in the project settings there is a symbol __heap_size__ or __stack_size__ defined, then it will use these values. If not, it uses the default value (0x100 or 0x400 in above example). In the above example I can see that 0x100 for the heap and 0x400 for the stack is used. So how to define the linker symbols? Linker command line option to overwrite symbols in the linker script, for example to configure the heap and stack size. That way I can keep the same linker file for multiple projects, and the command line to the linker is used for custom settings. This entry was posted in ARM, Building, CPU's, Eclipse, Embedded, Freescale, gcc, KDS, Processor Expert, SDK, Tips & Tricks and tagged arm gcc, Building, Eclipse, Freescale, gnu gcc, Kinetis, Kinetis SDK, NXP, Processor Expert, software, software project, Tips&Tricks, tool chains by Erich Styger. Bookmark the permalink. What about combined STACK/HEAP — a single RAM allocation for stack and heap to claim from opposite ends? Under Keil uVision (V5.10.0.2 to be precise) with ProcessorExpert v10.2, and with some digging by my comrade Greg Ross (kudos! ), we found we could make a single allocation for both to share. … um, where bCANARY_SALT( address ) returns a diversified but determinate pattern. SO THE POINT OF MY POST would be, how might we accomplish as much in this post-ProcessorExpert era? thing which can be very handy. I know that Energy Micro projects use an interesting approach with simply setting the stack pointer at the end of the available RAM. There is still the issue that it might spill over into the variables area, but that way at least the maxiumum of available RAM is left to the startup stack. 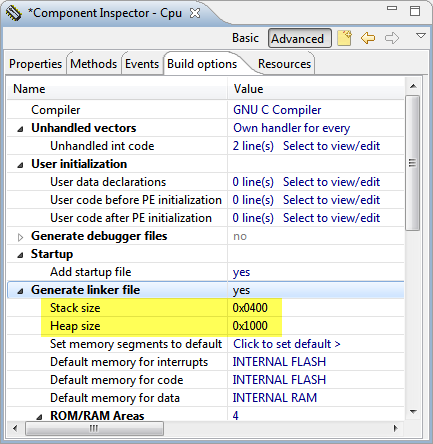 How I can use processor expert and your componentes with SDK 2.0? This reminds me that I should finish writing that article. But there was not enough time available this week-end to finish it :-(. Rather than entering the extra flags in the “Other Flags” field at the bottom, it’s cleaner and more visible to just enter (for instance) “-defsym=__heap_size__=0x2000” (no quotes) in the large Linker Flags field at the top. You can then verify that -Xlinker -defsym=__heap_size__=0x2000 is being inserted into the command line by looking at the resulting command line under Cross ARM C++ Linker / All options. Doing it this way worked fine for me (using KDS 3.2.0). thanks for sharing! 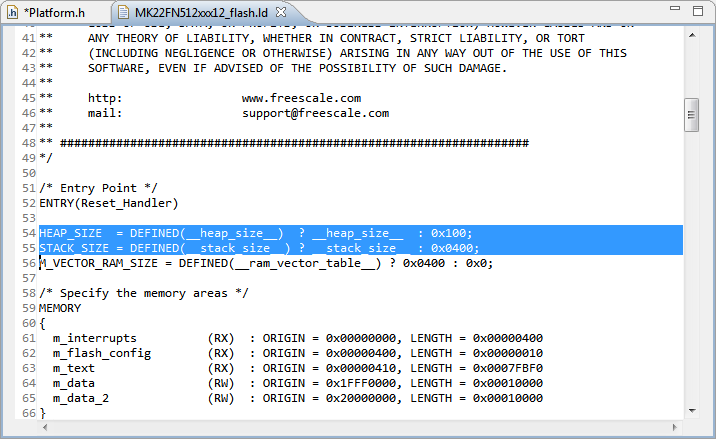 This is indeed another method for setting the heap size :-). Hi Erich, I’ve been struggling lately on trying to understand some concepts that are new for me on the ARM Cortex M world. I’m coming from HCS08 architecture as my favorite and the one I’ve mastered over more than 8 years, but every now and then when I choose a Kinetis MCU for a project I find new concepts, such as the heap. I understand completely what the stack is for, when it’s used, what is stored there, when is released, etc. But the heap is completely new for me. I’ve searched for an explanation of what it is good for but haven’t found anything. Could you point me to any document where I can learn about it? Thanks. Thank you so much Erich, now I get it.